Amazon was expected to disappoint investors because of weakness from the cloud. The firm disappointed investors because of the expected increase in investments and decelerating revenue growth. And also weak guidance, but not because of the cloud. Specifically, Q4 EPS was $6.04 which beat estimates for $5.68. Revenues were $72.4 billion which beat estimates for $71.9 billion. Amazon Web Services revenue was $7.43 billion which beat estimates for $7.3 billion. Sales growth was 19.7% which beat estimates for 18.8%, but was the slowest since Q1 2015. The Whole Foods acquisition pulled down North American revenue growth from 42% last year to just 18%. Its stock fell during the earnings call after hours because the firm expected to increase investments in 2019. It ended up closing down 5.38% on Friday. Amazon investors have given the company the benefit of the doubt in its history in terms of profitability. The firm wouldn’t report great profits. But it had high revenue growth, so investors bid up the stock. Now the company has great profit growth because of Amazon Web Services, but it has lower revenue growth, so it’s being sold off. After initially leading the market off the bottom on Christmas Eve, the stock has quickly started to underperform. It is up 5.66% year to date, while the S&P 500 is up 7.73%. Investors are wondering about the growth in Prime members. Lower growth is a big deal because Prime members spend much more money on Amazon than non-Prime members. International sales growth slowed from 29% last year to 15%. Amazon is struggling in India because a new law that prevents online retailers from selling products through affiliated companies caused Amazon India to pull 400,000 items from its website. It would be terrible for the company if it can’t compete in India because its one of the fastest growing emerging markets. The firm issued guidance for Q1 revenues to be between $56 billion and $60 billion. Expectation was for $60.8 billion. Amazon Web Services had very strong revenue growth of 45%. Furthermore, its Other category which is dominated by its advertising business had 95% revenue growth which brought it to $3.4 billion. As I mentioned. AWS has turned Amazon into a profit machine as the firm had $3 billion in net income which was up 66% from last year. Even though the firm had $232.9 billion in revenue in 2018 which means it surpassed the $200 billion level for the first time, optimism on the stock has dimmed. At the euphoric peak, some investors were predicting its market cap would hit $2 trillion soon after hitting $1 trillion. Now its market cap is at $795.1 billion. It’s still the largest company in the world as it beats out Microsoft and Apple just barely. Even with the modest growth slowdown, America is one of the strongest developed markets. Manufacturing is once again red hot despite what the regional Fed indexes suggest. Industrial production was strong in December and both the Markit and ISM PMIs were very strong in January. Not only is U.S. manufacturing beating other developed markets, it is also defeating the global manufacturing PMI. Europe and Japan are seeing sharp decelerations, while America is seeing rapid acceleration. The Markit PMI increased from 53.8 to 54.9. Export sales were weak, but domestic orders were strong, and backlogs rose. Business confidence hit a 3 month high and cost inflation hit a 12 month low. Manufacturing is a global business, but America was still able to perform well in a slowing global environment. According to IHS Markit, Q1 GDP growth is on pace to hit 2.5%. That’s only manufacturing, it’s only for 1 month, and it doesn’t include the negative impact of the government shutdown. Assumption that Q1 growth would be below 2% just because of the negative impact of the government shutdown and because growth has been slowing was wrong. Amazon - We don’t know how the economy could react in February and March. Growth can easily accelerate again especially if the housing market rebounds. I’m not expecting 3% or more GDP growth, but it’s not a given that it won’t occur. 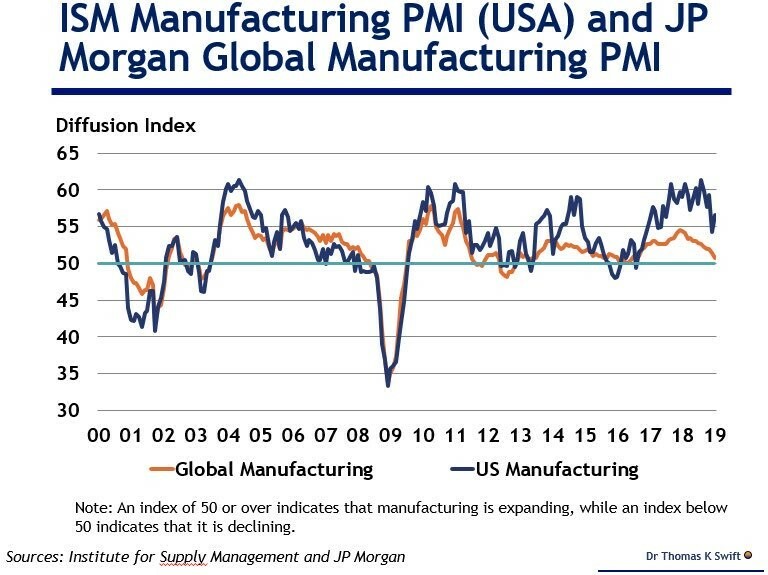 The chart below is a bit weird because it compares the JP Morgan IHS Markit report with the ISM PMI. Those are two separate reports. It could have easily reviewed the American Markit IHS report. Maybe it wanted to accentuate the difference because the ISM report was stronger. Either way, the JP Morgan global manufacturing PMI fell from 51.4 to 50.7. Global manufacturing hit a 31 month low. The only sub-component that signaled a contraction was new exports as the index fell from 49.7 to 49.4. Rare good news from this report is that the future output index increased from 58.8 to 60.7. Europe’s PMI hit a 50 month low and Japan’s PMI hit a 29 month low. Italy’s PMI was 47.8 which was a 68 month low. The global manufacturing PMI would have been 50 if it didn’t include America. America has a 21.6% share of global GDP. China is at second with a 12.7% share. China’s PMI was a disaster as the index fell to 48.3 which is the lowest since February 2016. With the negative momentum, it’s easy to see the global index falling into contraction. It will be interesting to see if global economies pull America down or if America brings the rest of the world back up. The bad news is the S&P 500 may have lost one of its leaders in Amazon for the next few months. The good news is the burst of economic data that came out on Friday signaled the American economy is doing fine.